Catch Simultaneous Debut Of WEEKLY SHONEN JUMP Series PLATINUM END By The Creators of DEATH NOTE, Along With Exciting New Titles, Special Bundle Promos, And A Preview Of The 24-Hour Cyber Monday Sale! VIZ Media delivers an extensive digital manga update for November that features a wide variety of new series launches and digital exclusives. Several new digital manga bundles are also offered this month, as well as a special 24-hour Cyber-Monday sale planned for November 30th. 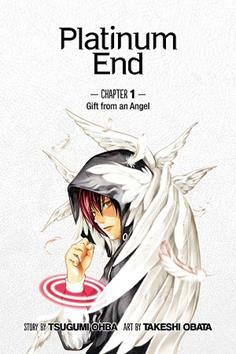 Fans will not want to miss the launch today of PLATINUM END, the brand new series by the creators of DEATH NOTE and BAKUMAN｡, offered as a digital exclusive from the VIZ Manga app, VIZManga.com, the WEEKLY SHONEN JUMP app, the shonenjump.viz.com website and also from ComiXology. Chapter 1 is available now for only $0.99, with new chapters of the series releasing monthly, simultaneous with Japan. Other new manga titles launching digitally this month include Arina Tanemura’s latest shojo series, IDOL DREAMS, the Shonen Jump fiction novel release of NARUTO: KAKASHI’S STORY, and the exclusive series debut of ZYWORD and EUREKA SEVEN: GRAVITY BOYS & LIFTING GIRLS. VIZ Media’s WEEKLY SHONEN JUMP digital manga magazine also delivers a pair of new series launches during November with the debut of a new chapter every week of JOJO’S BIZARRE ADVENTURE: PART 3 – STARDUST CRUSADERS along with the opening of a new “Jump Start” manga action series – BUDDY STRIKE – that starts on November 9th. Please visit shonenjump.viz.com for more information and access. DIGITAL MSRP: $6.99 (U.S. / CAN) · Available Now! Catch the debut of this new series by famed shojo manga creator Arina Tanemura! At age 31, office worker Chikage Deguchi feels she missed her chances at love and success. When word gets out that she’s a virgin, Chikage is humiliated and wishes she could return to the time when she was still young and popular. She takes an experimental drug that changes her appearance back to when she was 15. Now Chikage is determined to pursue everything she missed out on all those years ago—including becoming a star! DIGITAL MSRP: $10.99 (U.S. / CAN) · Available Now! In this new fiction novel that also features artwork by NARUTO manga series creator Masashi Kishimoto, a year has passed since the Fourth Great Ninja War, and Kakashi’s appointment as Hokage looms. But first he heads to the Land of Waves for a dangerous mission rescuing hostages from a top-secret airship. There he confronts a ninja whose heart is frozen by tragedy. Having lost both his friend’s eye and his greatest abilities, can Kakashi protect anyone from his coldhearted foe? What is the true meaning of the Will of Fire gained in the distant heavens? Kakashi finds these answers and more as he enters a new ninja era. DIGITAL MSRP: $0.99 (U.S. / CAN) · Available Now! A brand new series being offered as a digital exclusive! From the legendary duo that brought you DEATH NOTE and BAKUMAN comes a dark story of humans and angels. Mirai is a boy who has lost hope in the future. Can a fateful meeting with an angel turn his life around, or will he be plunged into further despair in Takeshi Obata and Tsugumi Ohba’s newest series? Tamayo Akiyama, a former member of CLAMP, has crafted a fantasy adventure that will leave readers spellbound! Welcome to Zyword, a world filled with sorcery. When Zyword’s Araimel Kingdom is put under a spell, it’s up to the two sole survivors to save the citizens before they perish in an eternal sleep! This is the story of young Ruri and Sumner, the characters from the Sony Playstation Eureka Seven video games, now featured in their own original manga! Additional November digital manga updates also include new volumes for more than 25 other continuing VIZ Media series. Notable releases include not-to-be-missed volumes for BLEACH (Vol. 65), MY HERO ACADEMIA (Vol. 2), NISEKOI (Vol. 12), TERRA FORMARS (Vol. 9), and ULTRAMAN (Vol. 2), along with the series finales for YUKARISM (Vol. 4), CLAMP SCHOOL DETECTIVES (Vol. 3), and KAMIYADORI (Vol. 5).